This is just my kind of thing. It's a little stiff, but cute. I got lots of compliments while wearing it. Make a stylish statement with this double wrap bracelet from Thailand. 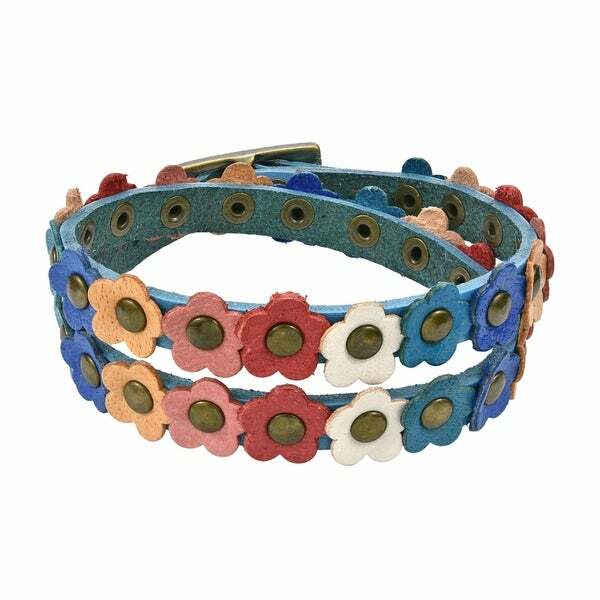 Crafted by hand, this bracelet is fashion with genuine leather depicting a multicolor mini floral design on a blue, purple, brown or white leather band. I bought this bracelet for our 12-year old niece's birthday. She loved it. It was totally unique. Very intricate design and fit her well. Cute bracelete but a little difficult to put on single handed. The leather has to soften I think. It looks very nice on though. Very nice piece, I ordered a white one and it's very cute and good quality. It came in within 3 business days. All around I am a happy customer. "Which color band isn’t in bottom left in photo?" We have the blue and purple only.